PLEASE tell me you guys made Hobo Roasts growing up in the ’80s and ’90s. You didn’t fully experience the magic of that era unless you made these on the regs. While wearing jams and watching Fresh Prince of Bel Air, duh. We had them once a week. And I mean it. My mom had our weekly meal rotation fine-tuned like wowza. I think she even called them Hobo Joes. Or Hobo Joe’s. No no, Joes. I don’t knows. But back then it was simple. 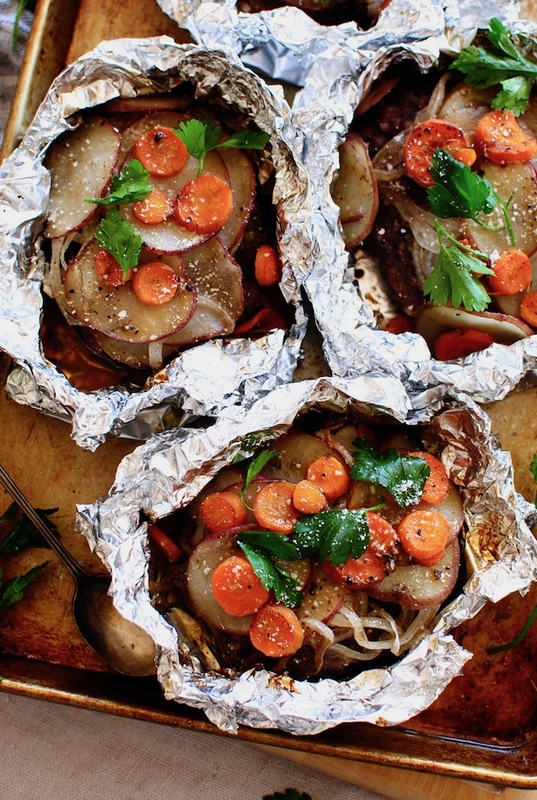 You bought pre-made hamburger patties and plopped them in some foil. 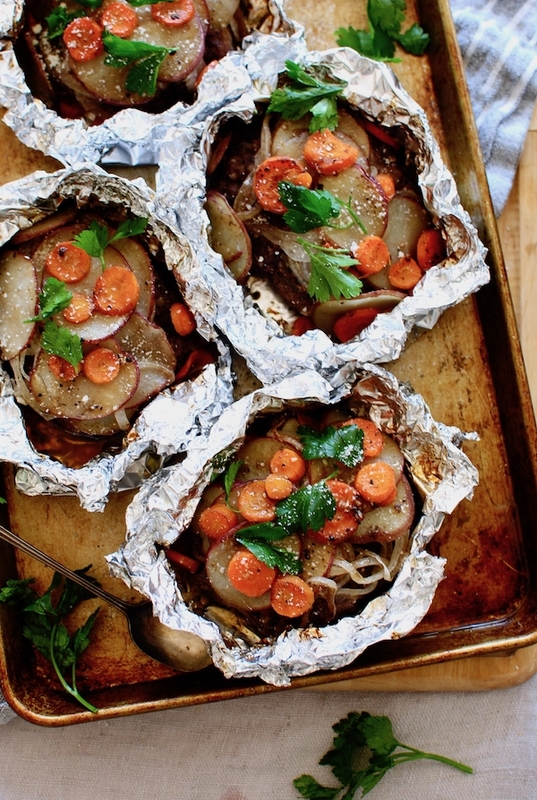 Topped them with sliced onions, carrots and potatoes. 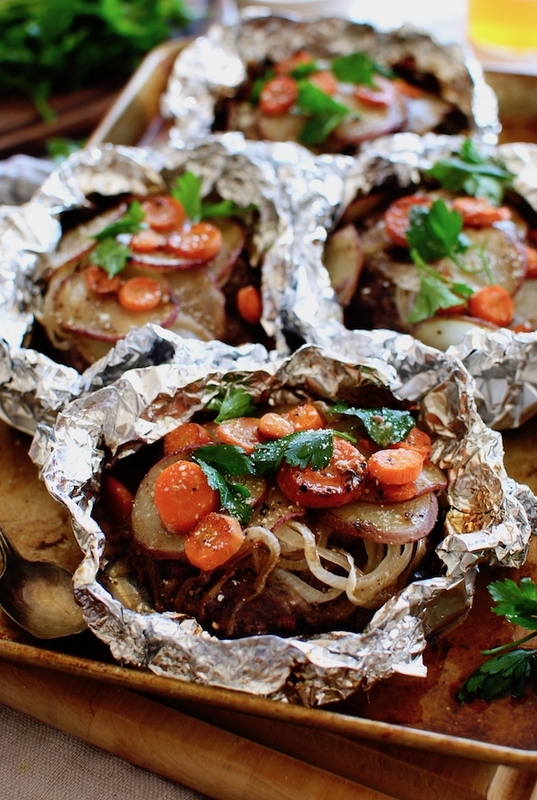 Drizzle with Worcestershire sauce, pinch the foil together and bake for an hour. Dive and in call it Frank. I mean good. But you know me and my obsessive need to complicate things . . .
Not that I get all willy nilly with it. I stay pretty true to the original recipe, swearsies! Which, speaking of – this one in particular comes from an oooooold Baptist church cookbook. I wanna say either late ’70s or early ’80s. There are no measurements and no concrete directions, which always makes me giggle slash twitch when it comes to old school recipes. You just DID. You didn’t care too much about amounts or skill or whatevs. Just throw it together and slap it silly. So the meat! I actually mixed ground beef and pork. The pork gives it a little more OOMPH. Some guts. But without getting overly tough, you know. The FLAVOR of the patties though, is something we gotsa talk about. This will be the only part that you will fully take the reins yourself and go loco. Becauuuuuse I randomly found this meatloaf seasoning at a local garden nursery last month, and I’ve been putting it on and in everything. But listen! I just googled meatloaf seasoning, and look. It’s everywhere. If you can’t find that, an onion seasoning mix would totally work. Another James Bond trick with this, is to use a mandolin! You know I’ve been begging you to buy a mandolin for Y-E-A-R-S now, so just do it already, for the sake of the baby ponies. It will transform your life. Because you want those onions and potatoes thiiiinly and evenly sliced, so that they cook at the same time and one bite isn’t randomly crunchy, leaving you in a fit of defeated tears. Oh! Let’s start a band called Fit of Defeated Tears. We’re gonna get so boo’d. Look! One hour total. 50 minutes with the foil pinched together, and then during the last 10 minutes, open the foil up so that the veggies have a chance to brown juuuust a tad. 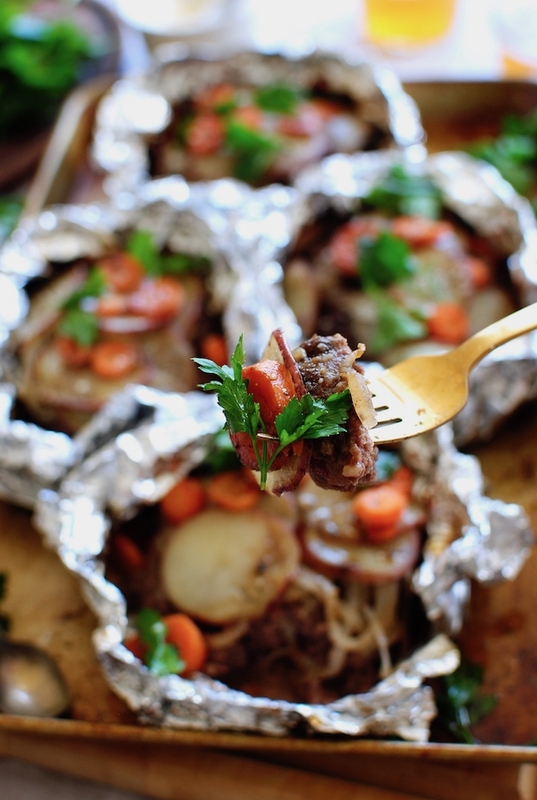 Speaking of pinching the foil – when I was a kid, my mom used to turn the foil corners up and in like devil horns, to indicate that it was mine because I didn’t like onions! Hahahaha. So what HAPPENS is the juices from the meat will collect in the bottom of the foil packets, so you can spoon it over each bite and basically weep for days to come. It’s sort of like camping food! But without bears and bugs and dying. I also garnished with fresh parsley and parmesan because you know how I do. In a large bowl, combine the beef, pork and meatloaf seasoning. 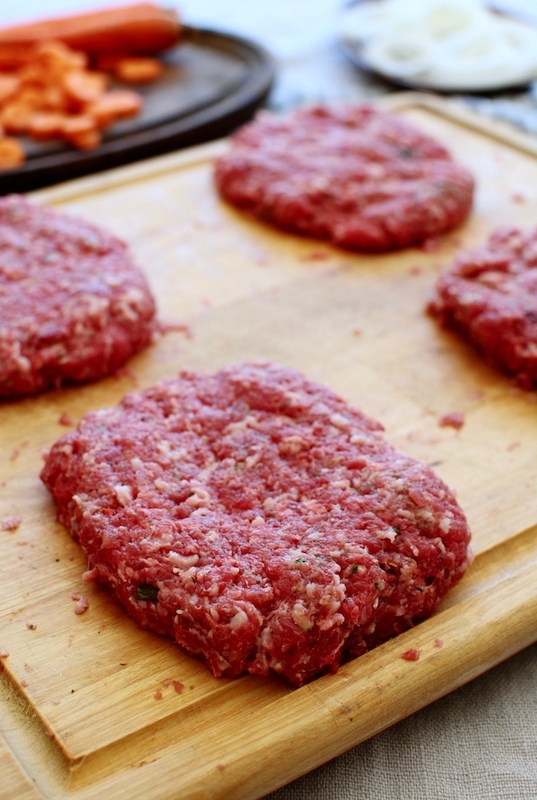 Divide into four big meatballs and press into rectangular patties. 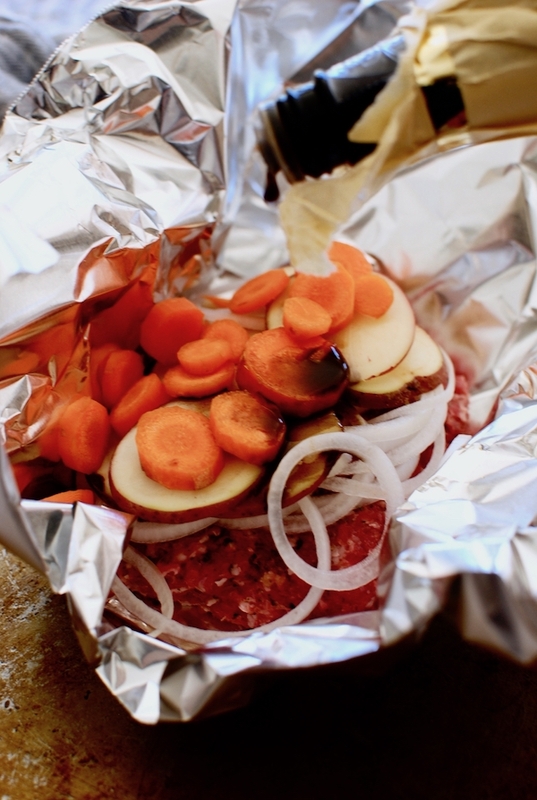 Place each patty in an aluminum foil pouch. Top with onions, potatoes and carrots. Season with a small pinch of salt and pepper. 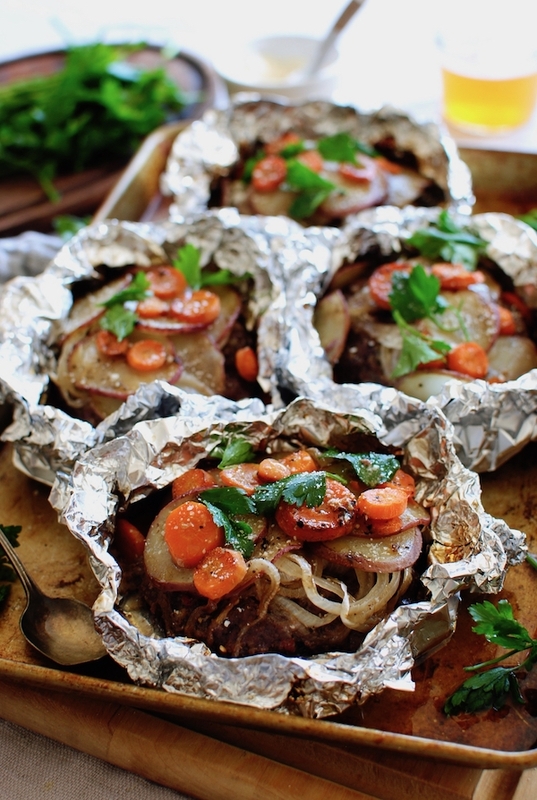 Seal up each foil pouch and bake for 50 minutes. 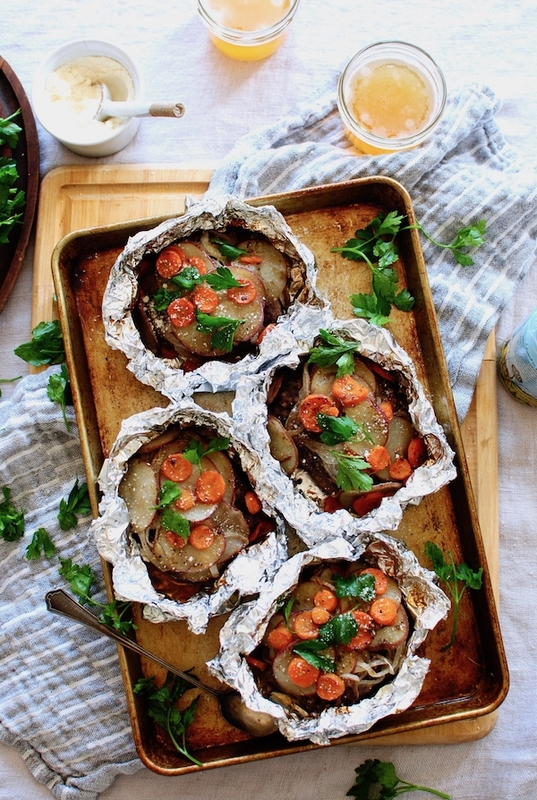 Open each pouch at the top and bake 10 more minutes, allowing the veggies to slightly brown. Let each pouch rest a few minutes, then garnish with fresh parsley and powered parmesan. GIT IN IT. Your family is gonna lose their freaking minds. You're killin' me Smalls! It's The Sandlot, of course! PS these look delish! Wanna try a really old school German recipe? Have you heard of sauerbraten? My German Grandma made it often and we were crazyyyyy for that meal! The roast marinates in the fridge in a pot of vinegar, water, onions and some salt, pepper, and I forget if she put anything else in...anyway it marinates for about 2-3 DAYS! Omgeee!! She cooked it using the marinade, made a sour gravy and served it with potato dumplings, and homemade red cabbage. Best. Meal. Ever. Please try it Bev! Let's see what you can do with this!! Btw, these look delicious! This recipe takes me right back to Day Camp when I was a little kid. You know, you are too young for overnight camp so you hang out with your buds at a week long camp (ours was done through our church) from about 9 in the morning until late afternoon and do goofy kinda- camp-like activities. On the last day, you got to stay 'late', like until 5 or something. For that night we always made Hobo Stew, which I swear was exactly what you've made here, but hold the fancy parsley and parm. Thanks for the trip back to my childhood. I had a mandolin...and then I almost only had 8 fingers. Those things are SHARP! Oh yeah! The guard is a MUST. Yum! Made with fish, theses were called a Shore Lunch in our house. Ate those many Fridays during Lent. 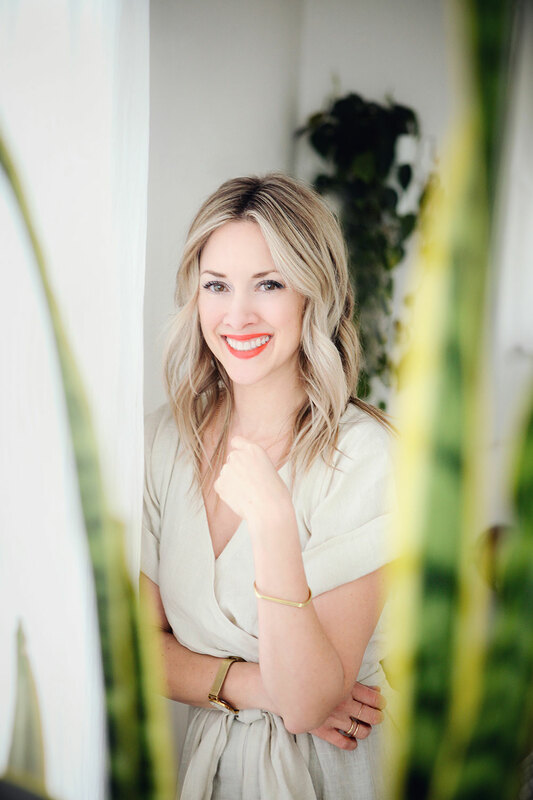 Love your version! I feel like you could really stuff them with veggies and the kids would eat them. Gotta introduce my daughter to The Sandlot! Thanks for the reminder! What else was on that meal rotation? I have total nostalgia for 80s family suppers! WELL - we did spaghetti and meat sauce once a week, Chicken Dorito, Chinese Fried Rice, and the rest of the time we were basically at church. Ha! You're killin' me smalls! Sandlot!!! BEST movie!!! Looks delicious! How was a 80's-90's kid without experiencing this?! Where is my mom...I'm gonna sue. In the meantime I NEED TO MAKE THIS. I linked different brands in the post! Let me know if you didn't see that. It should be very delicious, but it seems not easy to make. I just want to have a try tomorrow.